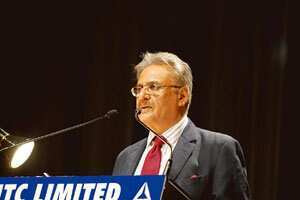 New Delhi: India’s biggest tobacco firm ITC Ltd posted a 4.2% increase in second quarter profit after raising prices of cigarettes earlier this year. Net income rose to Rs803 crore in the three months ended 30 September, from Rs771 crore a year ago, Kolkata-based ITC said in a statement on Friday. ITC is expanding sales of shampoo, food, clothing and other goods as the Union government increases taxes and restrictions on cigarettes for health reasons. Cigarettes account for about half the company’s revenue. “Cigarette sales have been robust as there has been a distinct customer shift to higher-priced filter cigarettes after the government raised taxes," said Abhijeet Kundu, an analyst at Mumbai-based Antique Securities Ltd.
ITC, 32% owned by British American Tobacco Plc., raised prices of the Gold Flake and Classic cigarette brands earlier this year. Sales in the second quarter rose 15% to Rs3,760 crore. Analysts had expected Rs3,810 crore. The cigarette maker’s stock dropped Rs9.55, or 5.66% , to Rs159.20 at close in Mumbai trading. The benchmark Sensex fell 10.96% to 8,701.07. ITC’s cigarette sales rose 15% to Rs1,810 crore in the second quarter. Profit before taxes and one-time gains increased 17% to Rs1,007 crore. The Union government imposed a nationwide ban on smoking in public places, including office buildings, restaurants and pubs on 2 October to prevent smoking-related diseases. In the Budget for the year to 31 March, the government raised taxes on non-filter cigarettes by as much as five times. The company discontinued the manufacturing of some non-filter cigarettes as it was unviable, it said. ITC raised prices of some cigarettes brands by as much as 10% in June.